The marketing website for the Apple Watch has been updated (via 9to5Mac) with additional details about how it functions as a watch, new ways that wearers will communicate, as well as more about the watch's health and fitness features. Apple's marketing team has also added new animations to the site, showing how the Apple Watch will move between screens and how some of the apps will work. Much of the basic information was already located on the Apple Watch site, but lots of it has been broken out with more information and detail. The new Timekeeping page reveals more about some of the watch faces that are included with the Apple Watch, including details about Complications -- specialized functions on a watch face like moon phases, sunrise and sunset, or, for the Apple Watch, stock quotes and weather. 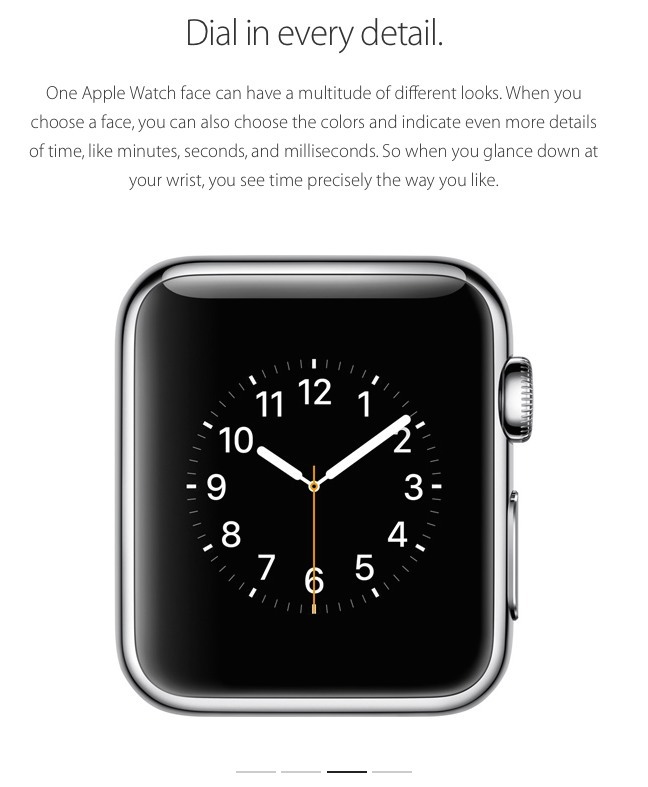 Apple Watch is first and foremost an incredibly accurate timepiece. It does everything a watch should, but in ways no other watch ever has. It's also connected to your calendar, your contacts, and your schedule. So in addition to showing you the time, Apple Watch actually understands what time means to you. It helps you be more productive and efficient. So you get more out of every moment. The New Ways to Connect page talks about the Friends feature that makes it easy to send messages, make a call, or reach out to other Apple Watch users. Wearers can send a tap, draw a picture, or share their heartbeat with other Apple Watch wearers, but they can also send and receive text messages, audio snippets, share a location, make phone calls and email right from the watch. Wearers can also use Handoff to start a call or email message from the Apple Watch and seamlessly transfer it to the iPhone. Finally, the new Health and Fitness page talks about the different ways Apple Watch measures movement, as well as additional details on the included Workout app. The watch tracks movement, exercise and how often the wearer stands up throughout the day, giving subtle reminders as needed to encourage more movement. The watch uses its accelerometer, heart rate sensor, as well as Wi-Fi and GPS locations from the iPhone to follow movement as well. The Workout app shows real-time stats including time, distance, calories burned, pace and speed for running, walking and cycling. All data is tracked over time, making it easy for wearers to track their improvement. Apple Watch is our most personal device ever, and there's nothing more personal than your health. Just as Apple Watch is designed to keep you more efficient, organized, and productive, it's also made to keep you moving. Because being active is vital to living a healthy life. The Apple Watch is scheduled to go on sale early next year, though Apple has not gotten any more specific than that. A timepiece. A communicator. A fitness tracker. I wish I had a white hipster friend like the girl in this post. $350 is an 'investment' to you? It's half the price of cell phones! Sigh, the youth of today. A $200,000 house is an Investment. Someday you'll earn real money and understand that $350 is just a drop in the bucket for most people. The Black Seal Panerai (US 12,000.00) watch is an investment, though it's uglier than Apple Watch. When you're in college preparing for grad school, yes, $350 is an investment. :p At least when it comes to a more novelty item. An iPhone or MacBook costs more, but provides a functional benefit. I am merely saying that I want to wait and see how the concept develops and make sure this isn't something Apple will dump in 2 years. I think the idea of interacting with a watch, as if doing that is less distracting in a meeting than looking at your phone, or frankly easier than doing so on your phone, is where Apple is wrong about the value proposition of the watch. Sure, I'll look at my watch a few times a day, but there is zero interaction, because I use an automatic watch that requires no interaction. I see the time, maybe the date, which is what I need to see. I Know I'm just one potential use case, but unless you are sending one line emails or texts, I don't know how it could possibly be of any use for reading or writing messages. And the fact that you really have to have your iPhone with you for the watch to work, then it becomes just a small redundant screen on your wrist. I've got a lot of Apple stuff, but the watch will need to do more than it is now before I'll think twice about giving up my Seiko automatic. "Apple Watch actually understands what time means to you..."
"To mute an incoming call, just cover Apple Watch with your hand." Don't know if we knew this before, but first time I read that we're going to be able to not answer calls just by placing our hand over Apple Watch. Pretty cool! Wonder how many of the 'not interested' brigade will end up buying one. Are YOU not getting it? These are not three separate devices. These are TWO devices. One on your wrist. And one in your pocket. with awful battery life, that must be tethered to an iPhone for many functions, and doesn't really solve an existing problem. No thanks.